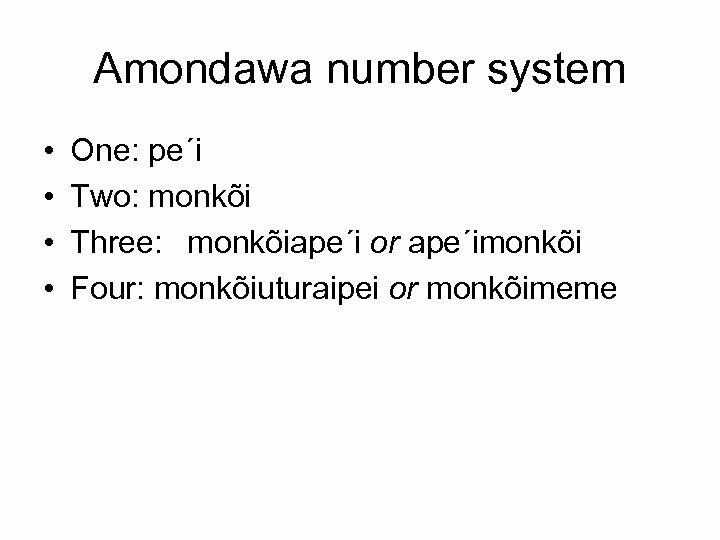 Can this be upheld as universal? 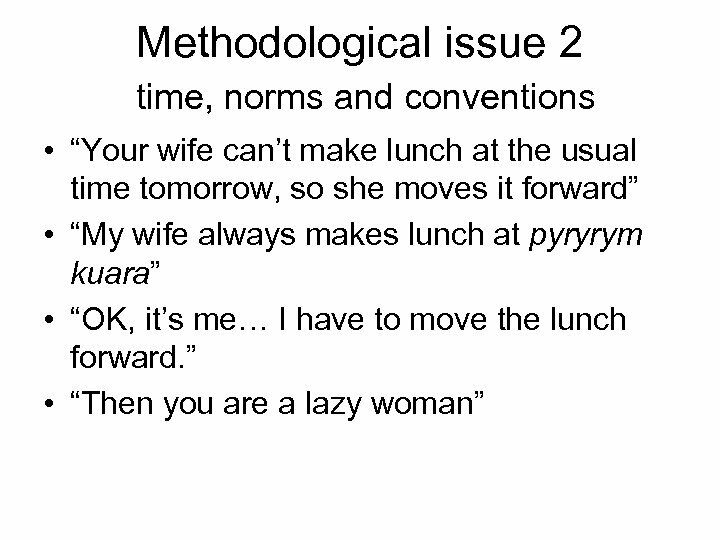 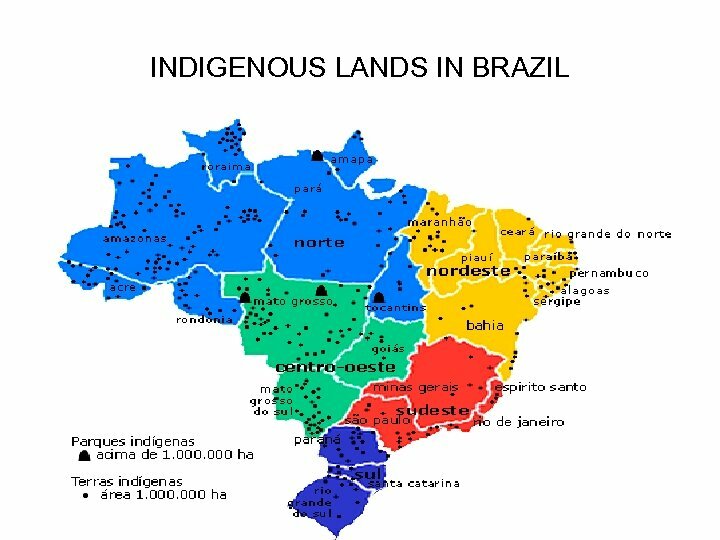 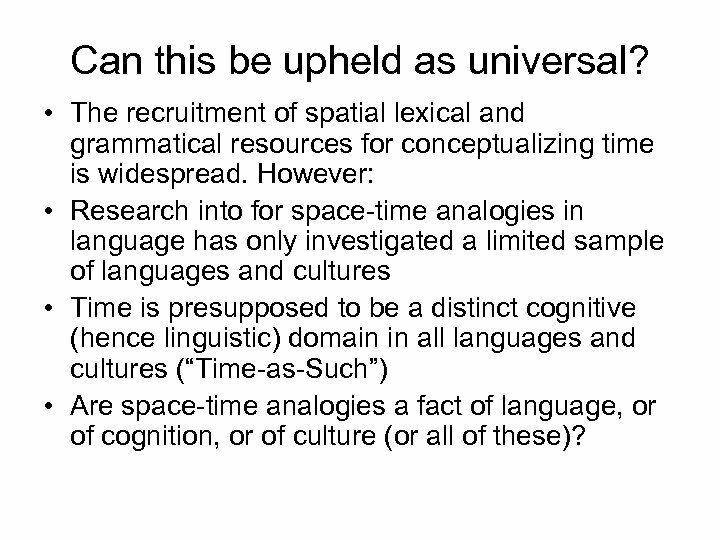 • The recruitment of spatial lexical and grammatical resources for conceptualizing time is widespread. 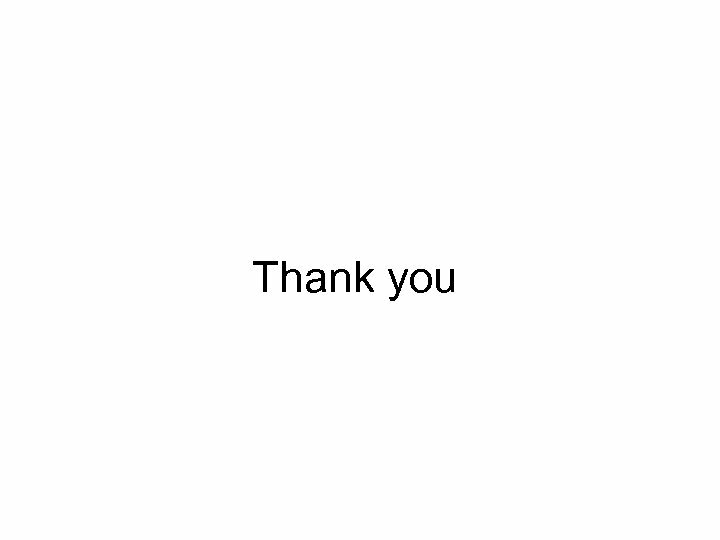 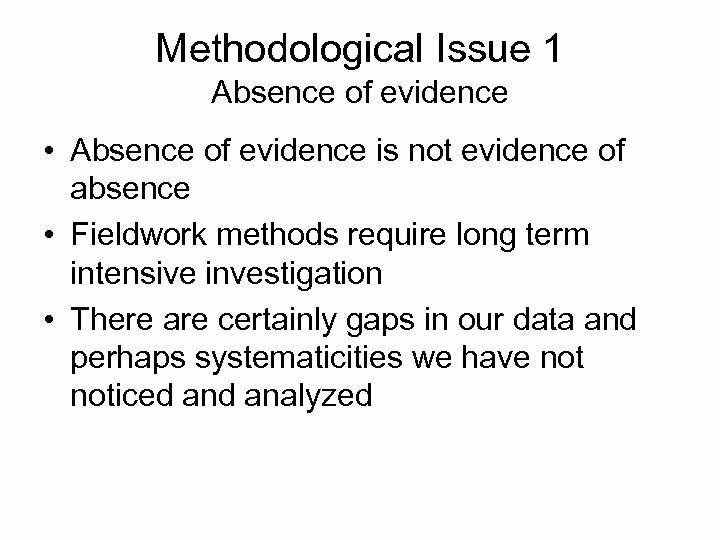 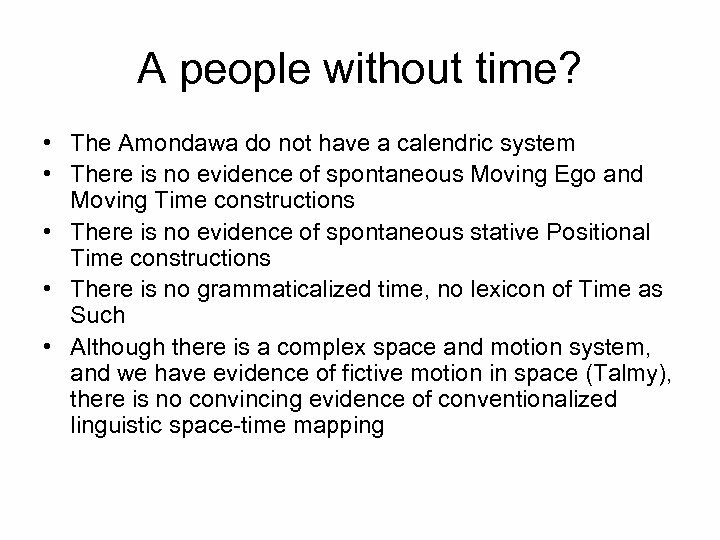 However: • Research into for space-time analogies in language has only investigated a limited sample of languages and cultures • Time is presupposed to be a distinct cognitive (hence linguistic) domain in all languages and cultures (“Time-as-Such”) • Are space-time analogies a fact of language, or of cognition, or of culture (or all of these)? 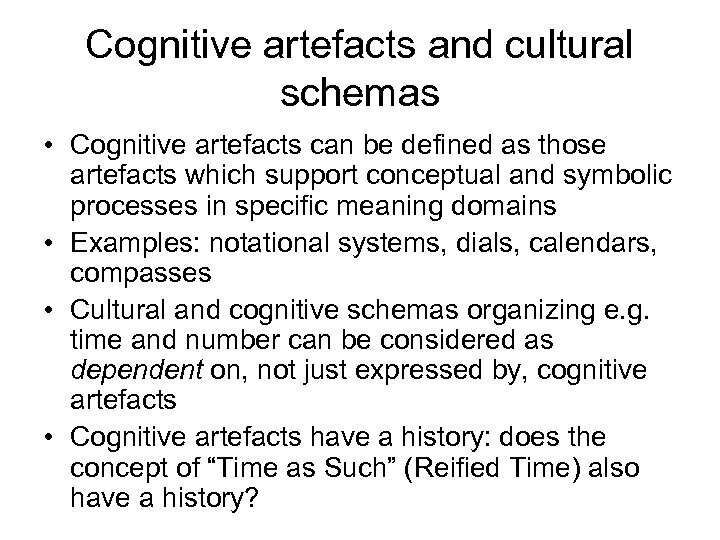 Cognitive artefacts and cultural schemas • Cognitive artefacts can be defined as those artefacts which support conceptual and symbolic processes in specific meaning domains • Examples: notational systems, dials, calendars, compasses • Cultural and cognitive schemas organizing e. g. time and number can be considered as dependent on, not just expressed by, cognitive artefacts • Cognitive artefacts have a history: does the concept of “Time as Such” (Reified Time) also have a history? 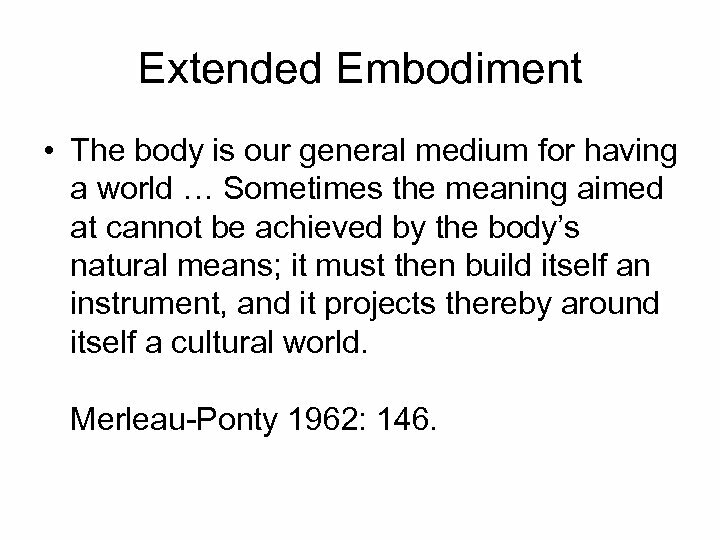 Extended Embodiment • The body is our general medium for having a world … Sometimes the meaning aimed at cannot be achieved by the body’s natural means; it must then build itself an instrument, and it projects thereby around itself a cultural world. 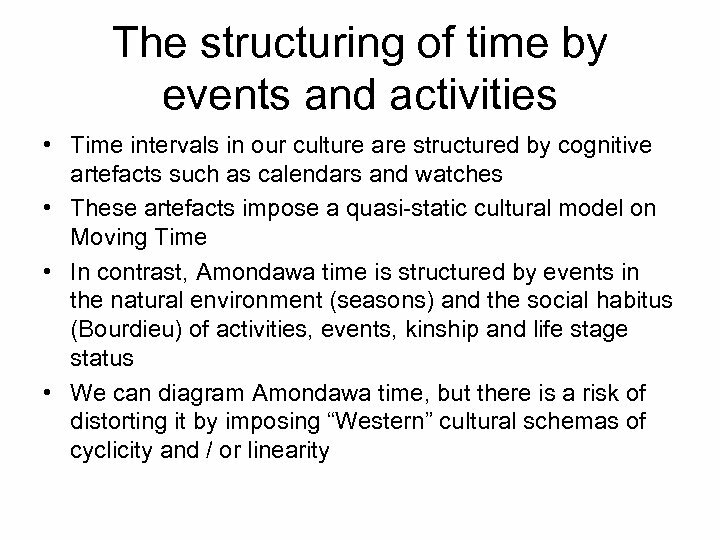 Merleau-Ponty 1962: 146. 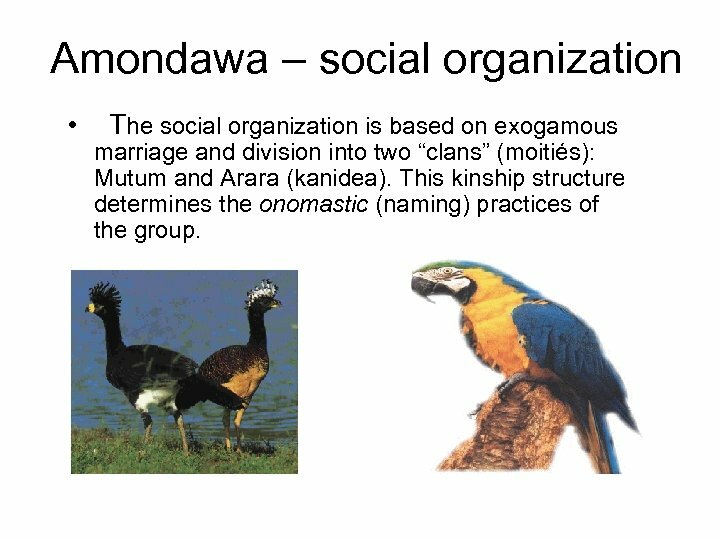 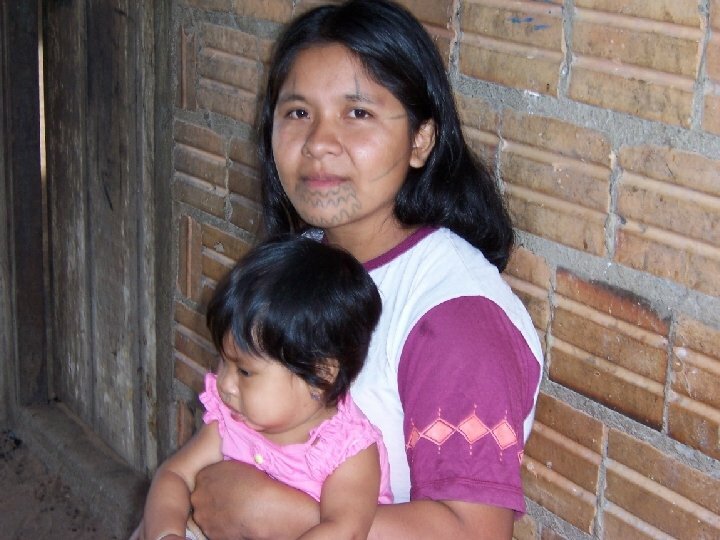 Amondawa – social organization • The social organization is based on exogamous marriage and division into two “clans” (moitiés): Mutum and Arara (kanidea). 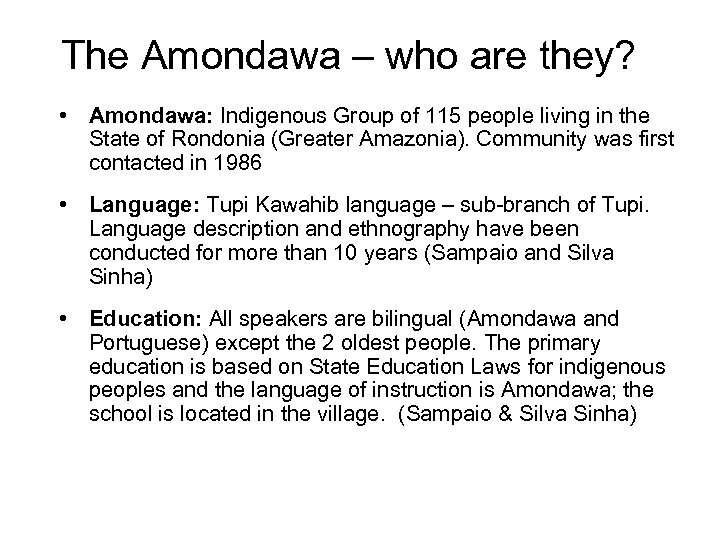 This kinship structure determines the onomastic (naming) practices of the group. 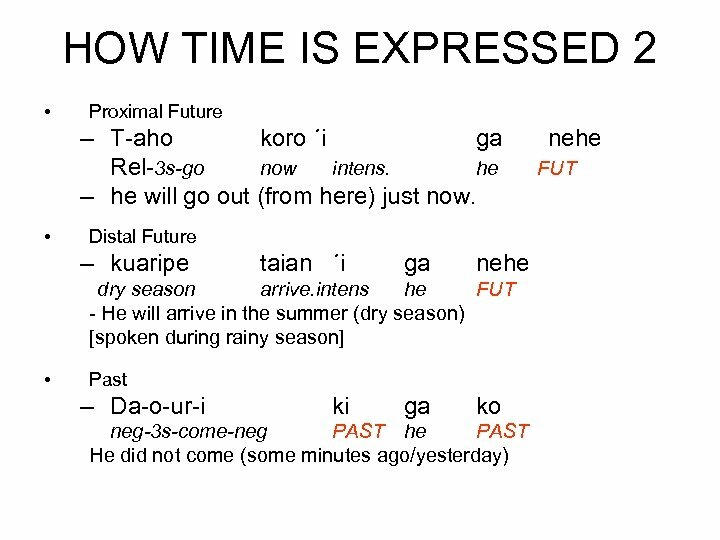 HOW TIME IS EXPRESSED • Dependent morphemes or particles: – future nehe, poti … nehe; – past: ki…ko, ki…i´i, emo, ramo. 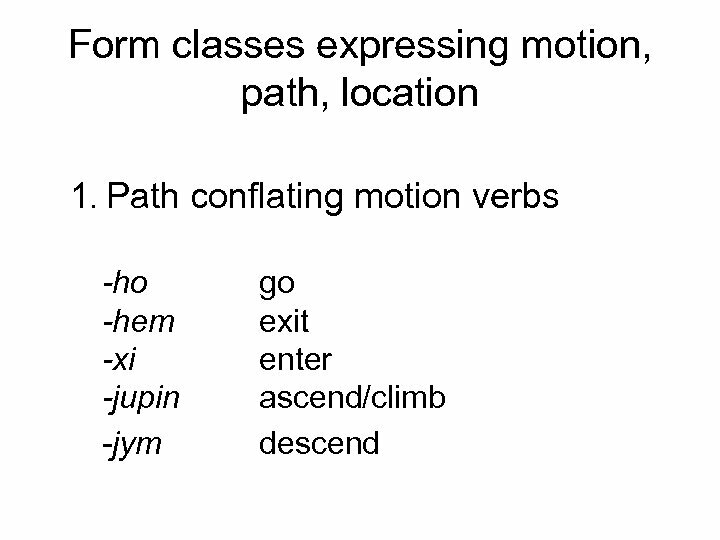 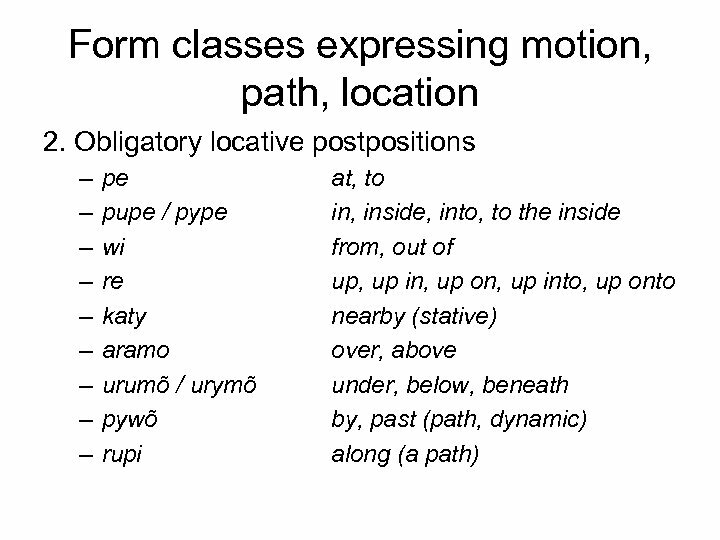 – these morphemes also express modal, aspectual and evidential notions (intention, desire, perfectivity, continuous action, event witnessed by speaker etc. ) 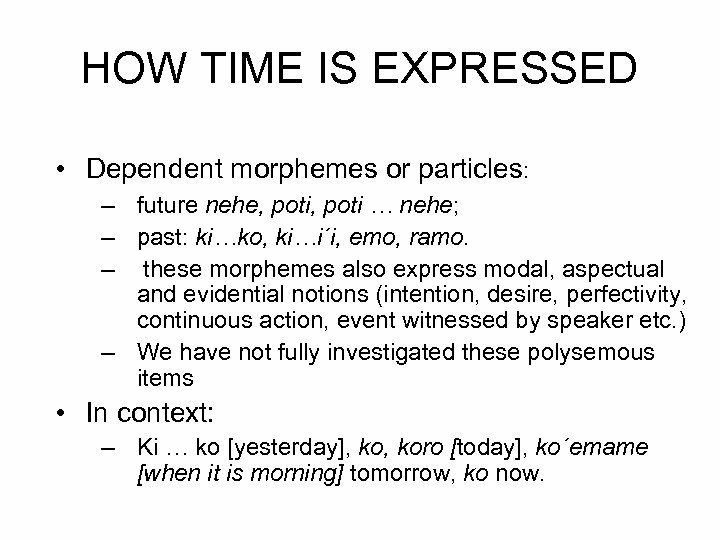 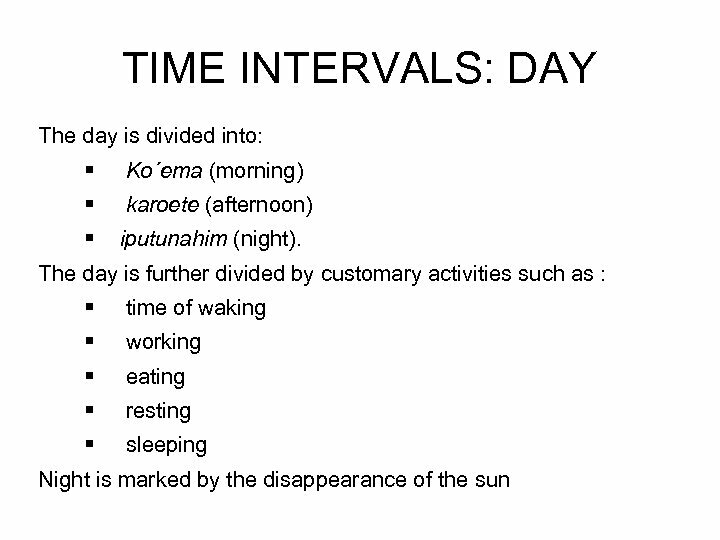 – We have not fully investigated these polysemous items • In context: – Ki … ko [yesterday], koro [today], ko´emame [when it is morning] tomorrow, ko now. 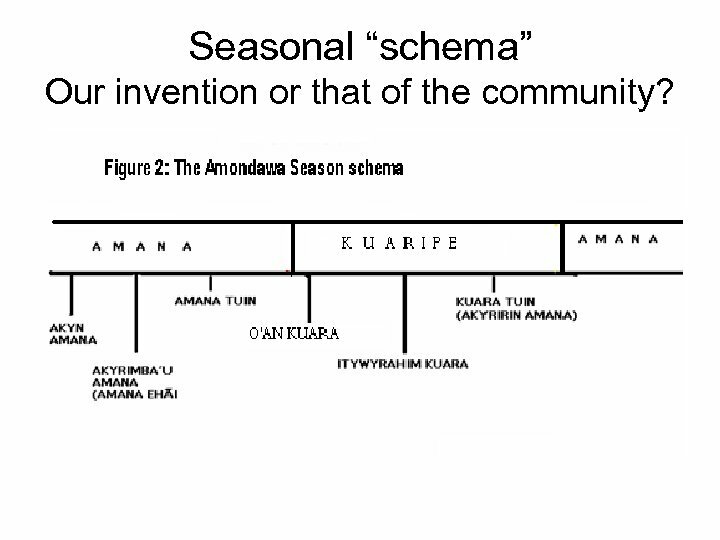 Seasonal “schema” Our invention or that of the community? 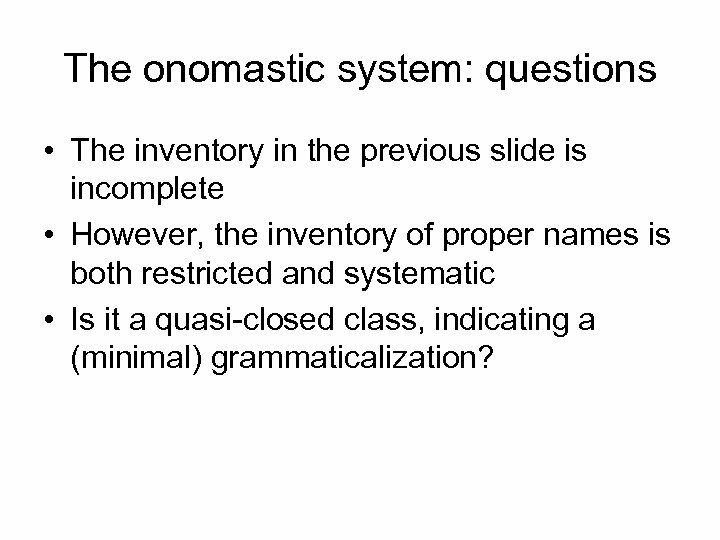 The onomastic system: questions • The inventory in the previous slide is incomplete • However, the inventory of proper names is both restricted and systematic • Is it a quasi-closed class, indicating a (minimal) grammaticalization? 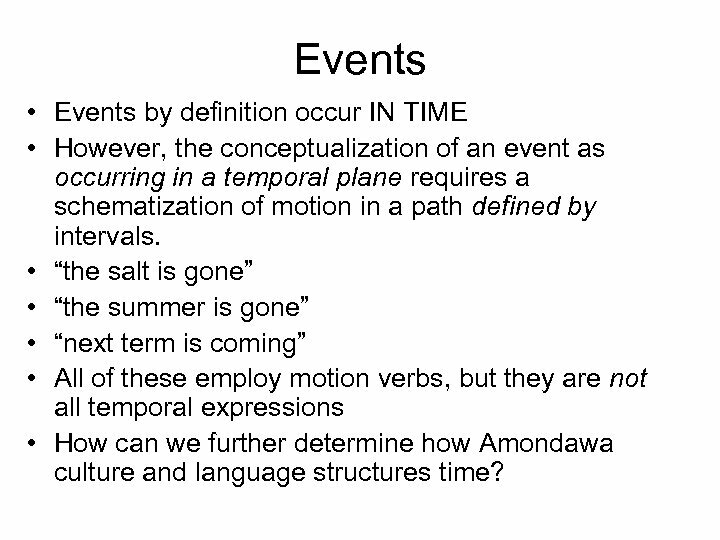 Events • Events by definition occur IN TIME • However, the conceptualization of an event as occurring in a temporal plane requires a schematization of motion in a path defined by intervals. 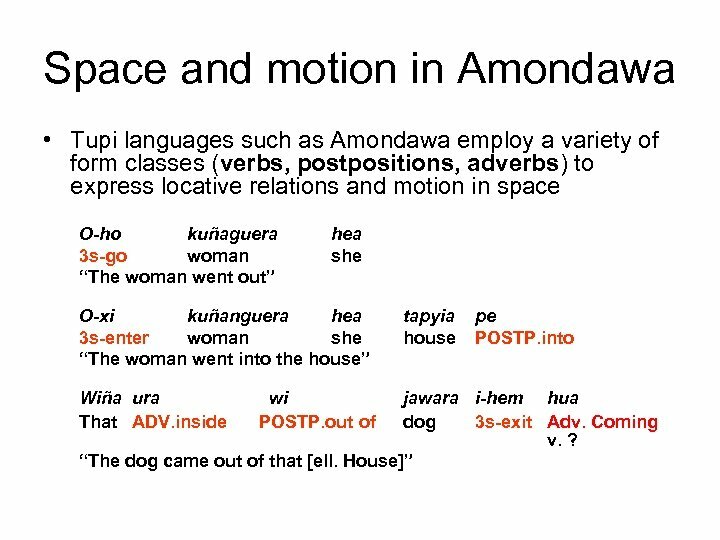 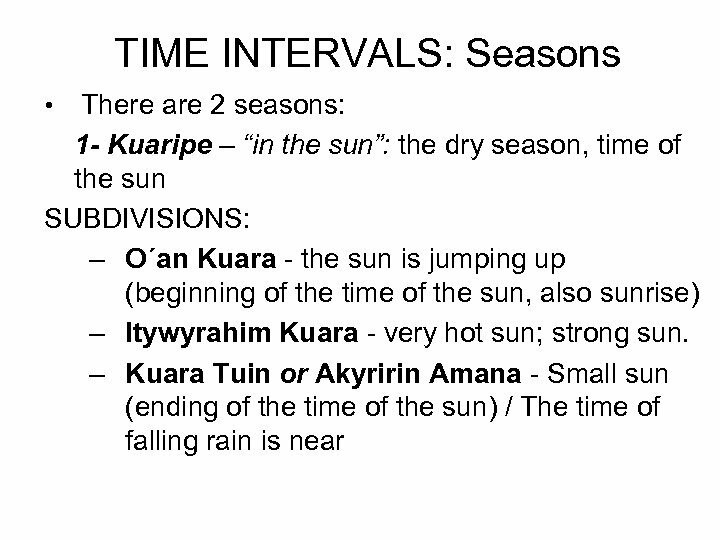 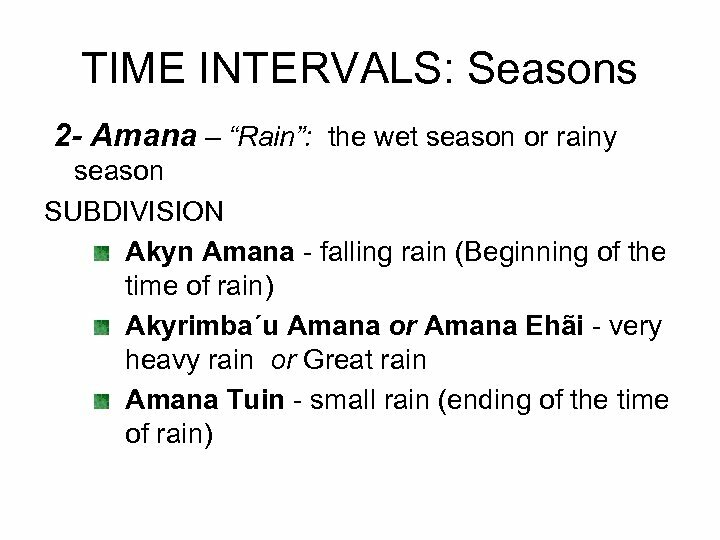 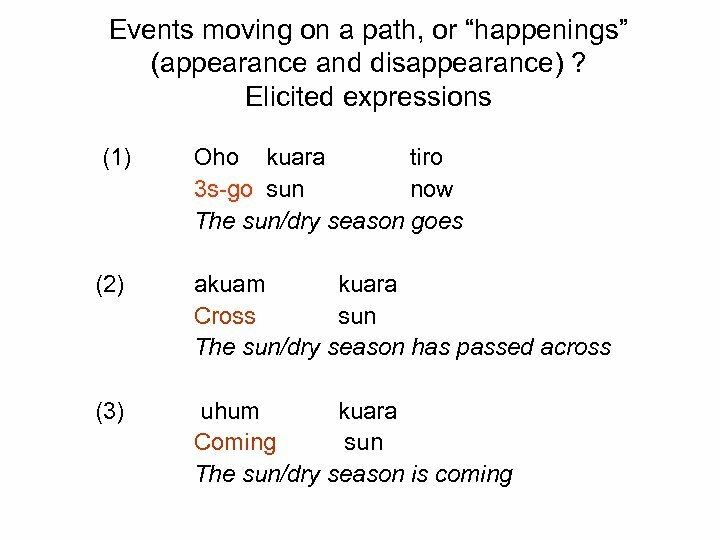 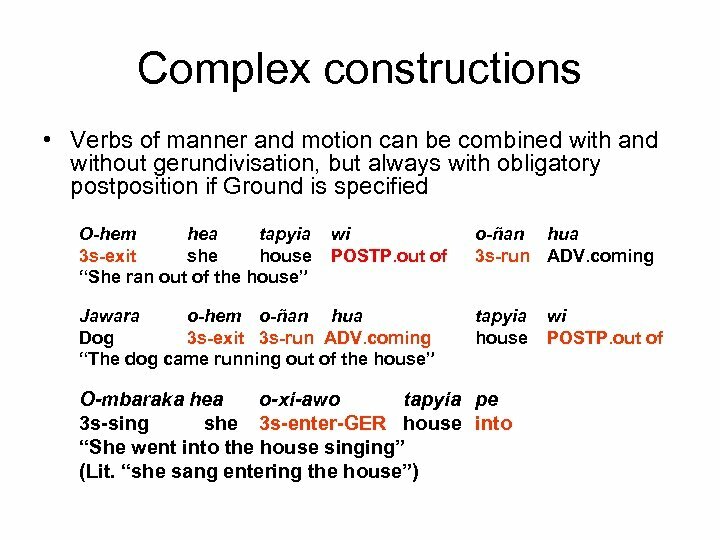 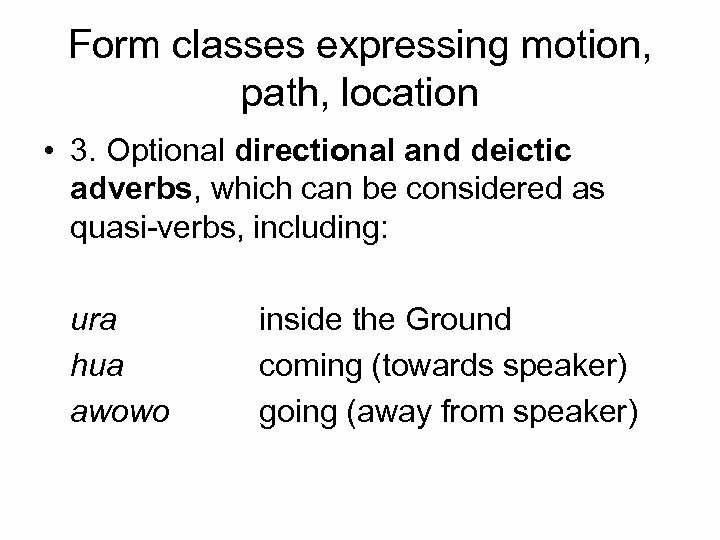 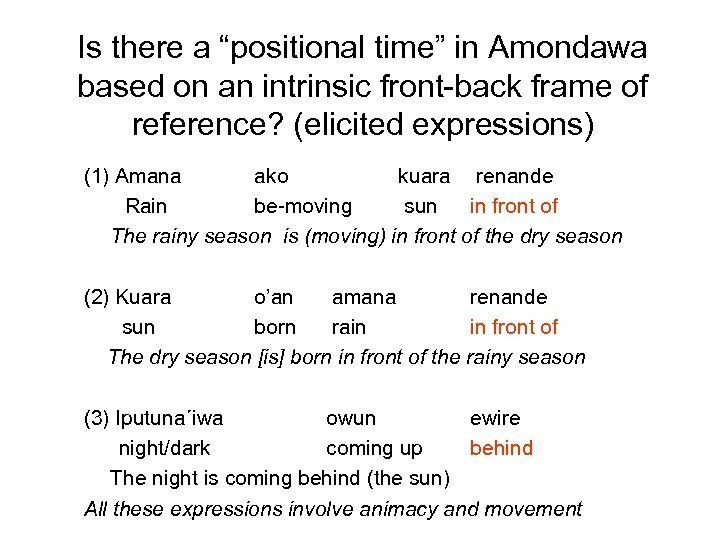 • “the salt is gone” • “the summer is gone” • “next term is coming” • All of these employ motion verbs, but they are not all temporal expressions • How can we further determine how Amondawa culture and language structures time? 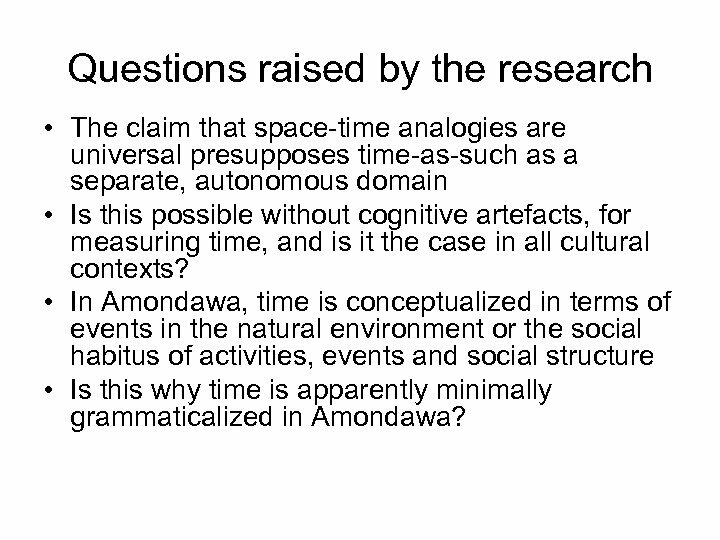 Questions raised by the research • The claim that space-time analogies are universal presupposes time-as-such as a separate, autonomous domain • Is this possible without cognitive artefacts, for measuring time, and is it the case in all cultural contexts? 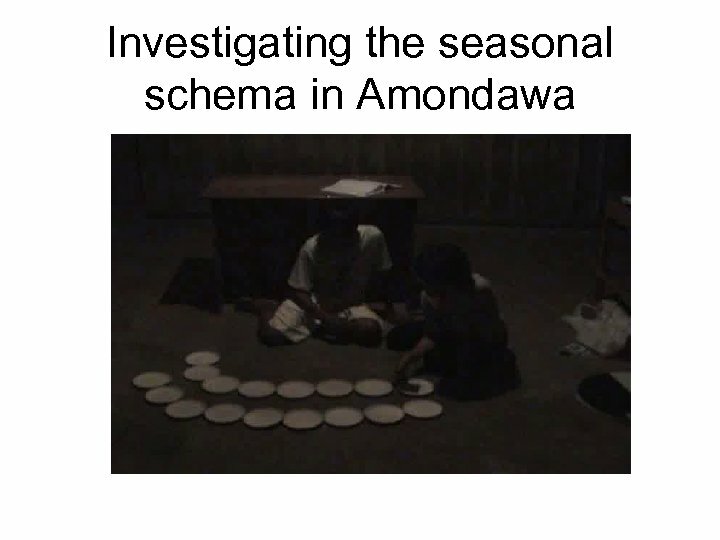 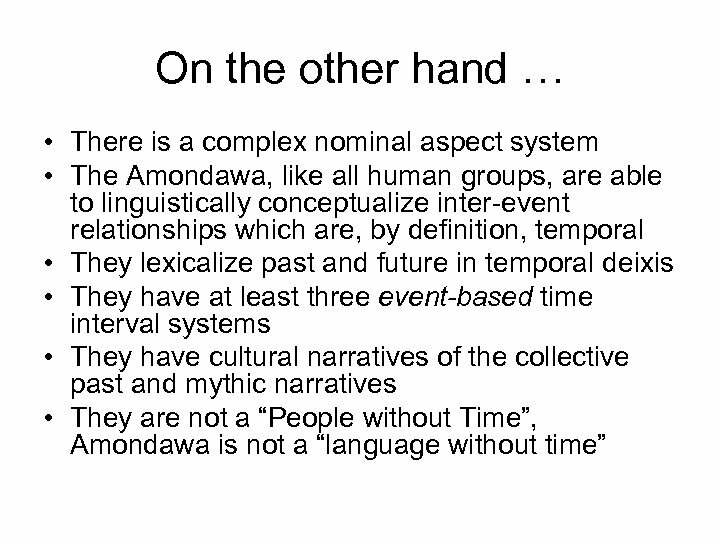 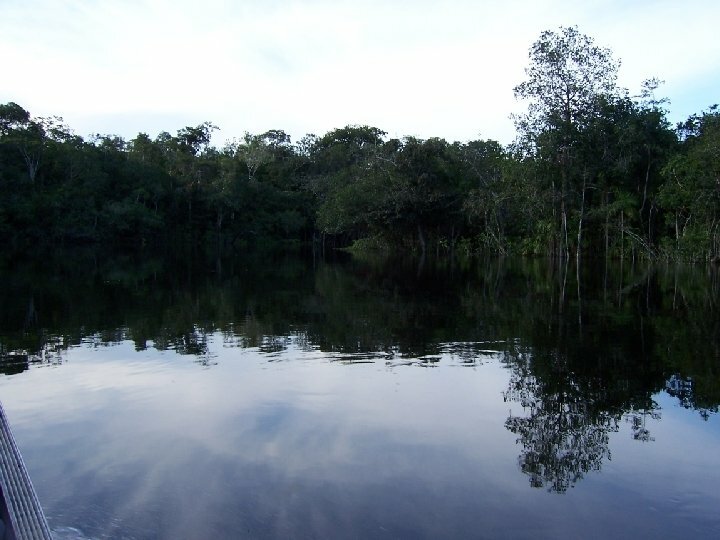 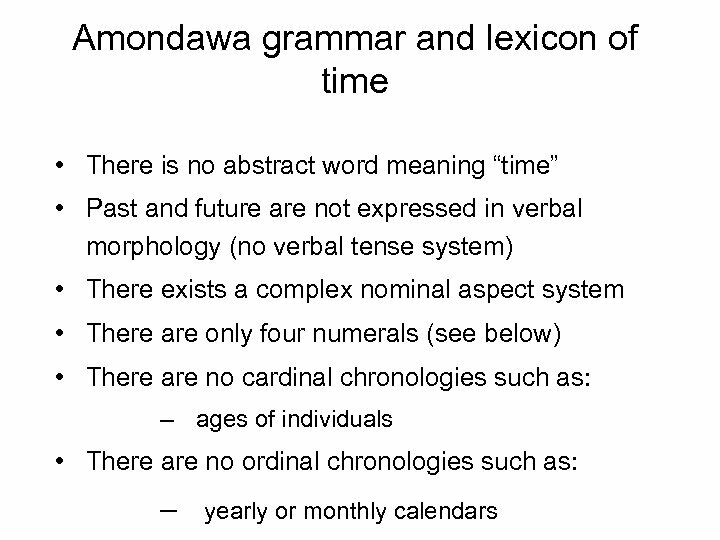 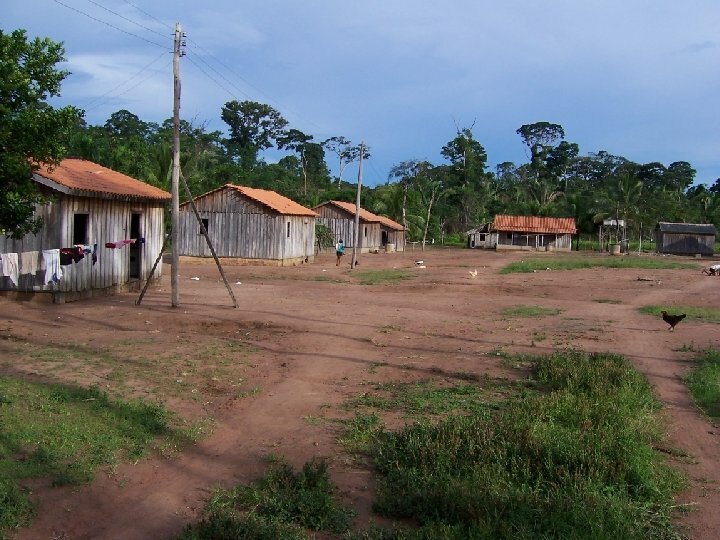 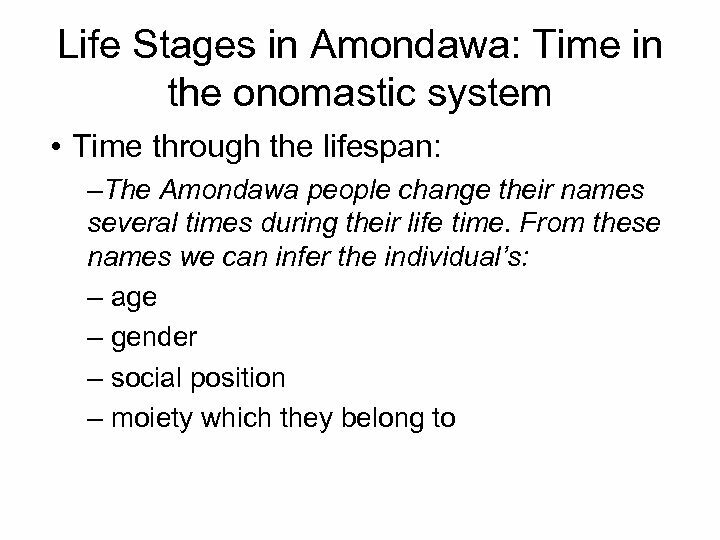 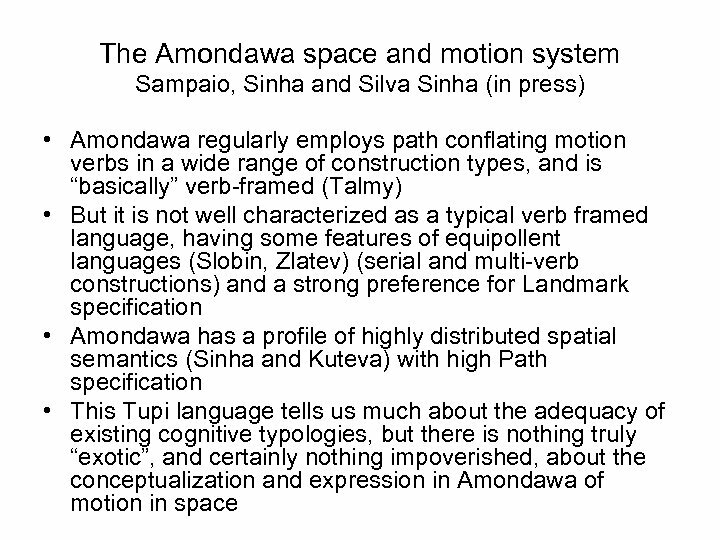 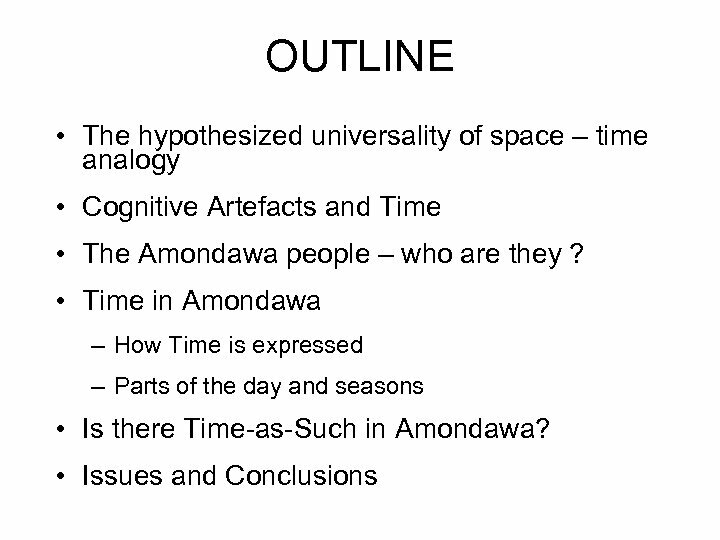 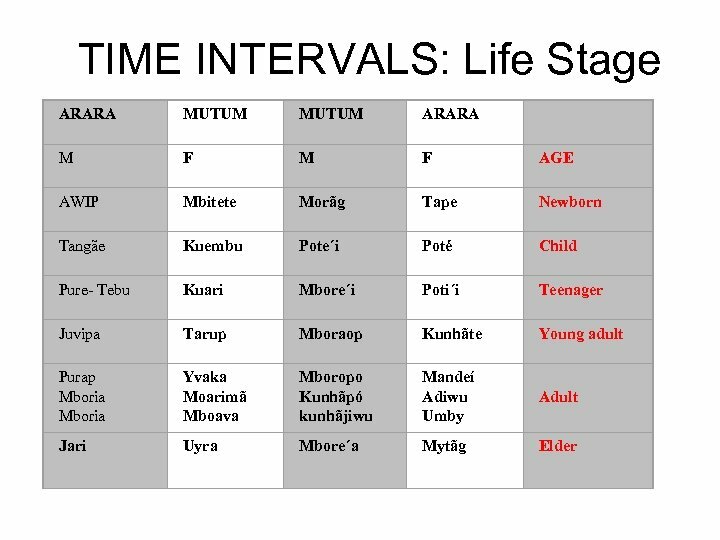 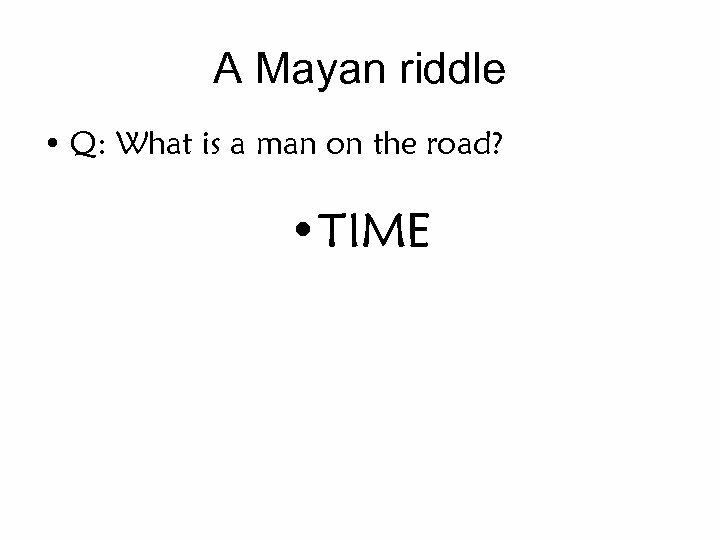 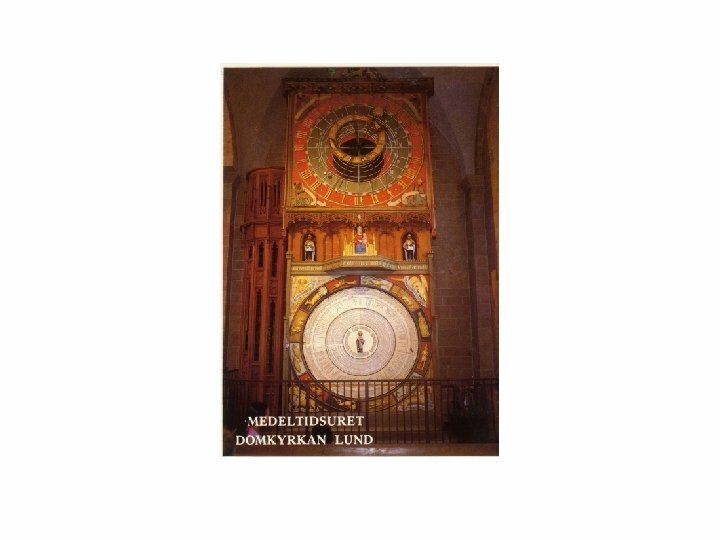 • In Amondawa, time is conceptualized in terms of events in the natural environment or the social habitus of activities, events and social structure • Is this why time is apparently minimally grammaticalized in Amondawa? 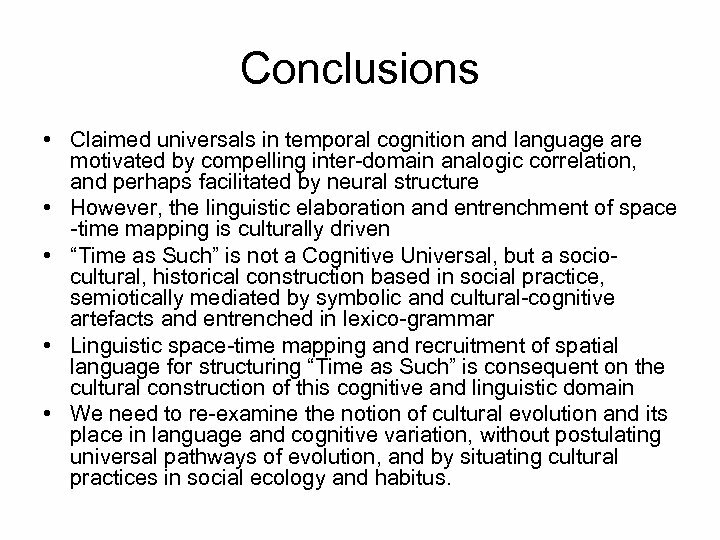 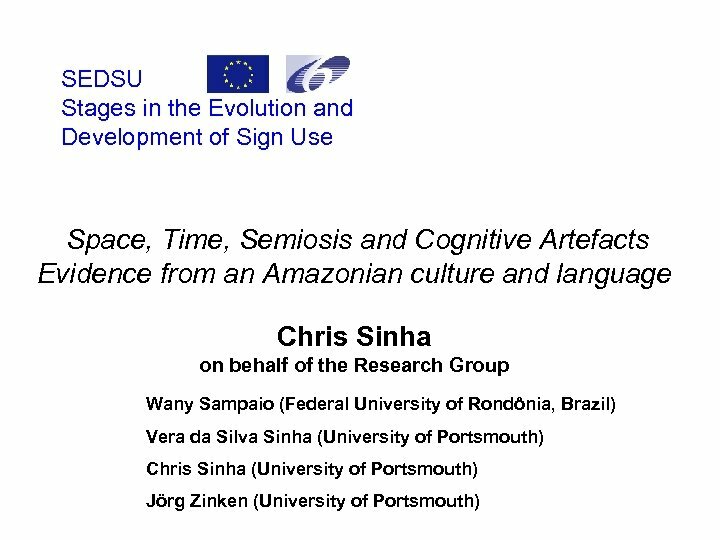 Conclusions • Claimed universals in temporal cognition and language are motivated by compelling inter-domain analogic correlation, and perhaps facilitated by neural structure • However, the linguistic elaboration and entrenchment of space -time mapping is culturally driven • “Time as Such” is not a Cognitive Universal, but a sociocultural, historical construction based in social practice, semiotically mediated by symbolic and cultural-cognitive artefacts and entrenched in lexico-grammar • Linguistic space-time mapping and recruitment of spatial language for structuring “Time as Such” is consequent on the cultural construction of this cognitive and linguistic domain • We need to re-examine the notion of cultural evolution and its place in language and cognitive variation, without postulating universal pathways of evolution, and by situating cultural practices in social ecology and habitus. 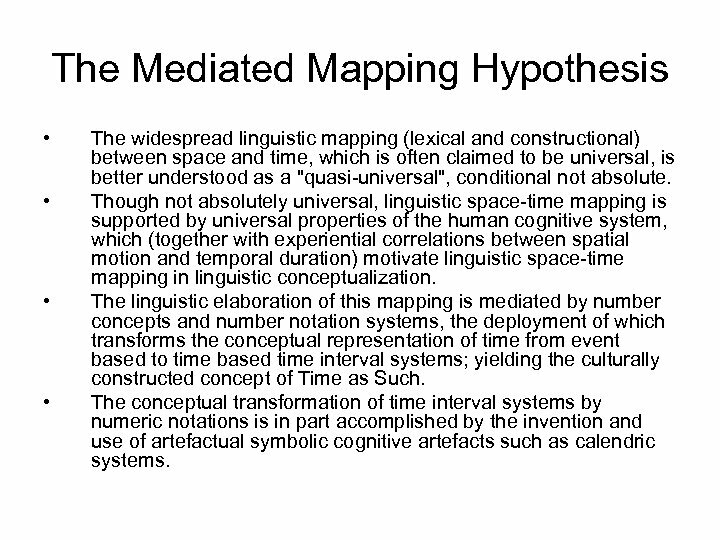 The Mediated Mapping Hypothesis • • The widespread linguistic mapping (lexical and constructional) between space and time, which is often claimed to be universal, is better understood as a "quasi-universal", conditional not absolute. 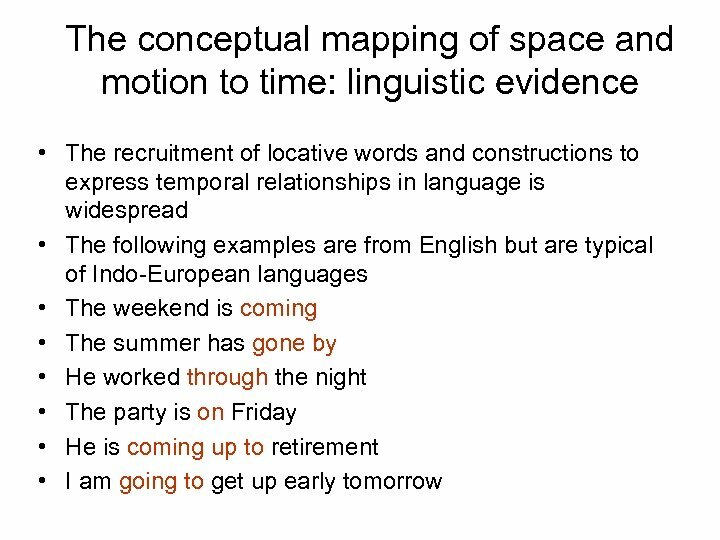 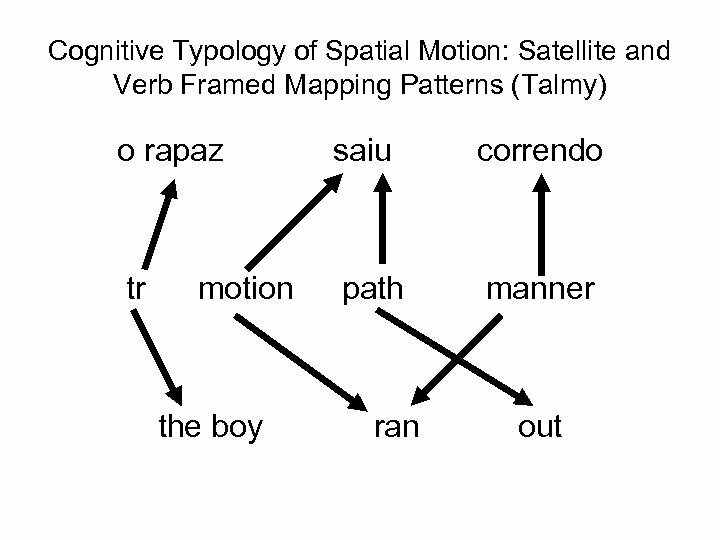 Though not absolutely universal, linguistic space-time mapping is supported by universal properties of the human cognitive system, which (together with experiential correlations between spatial motion and temporal duration) motivate linguistic space-time mapping in linguistic conceptualization. 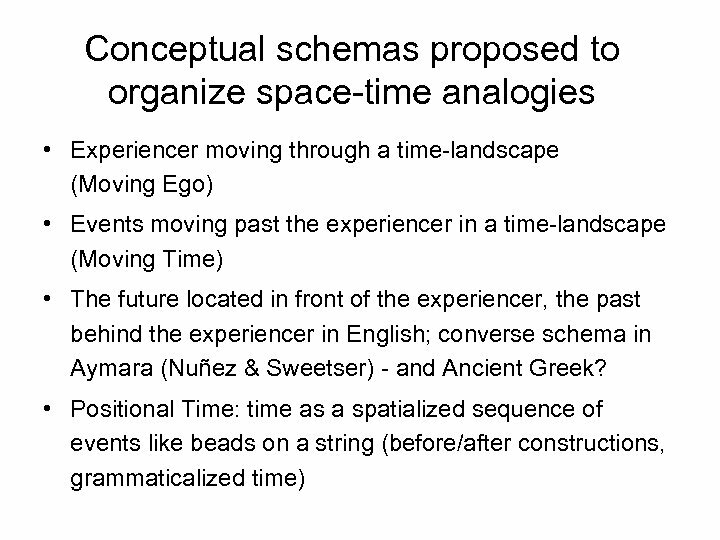 The linguistic elaboration of this mapping is mediated by number concepts and number notation systems, the deployment of which transforms the conceptual representation of time from event based to time based time interval systems; yielding the culturally constructed concept of Time as Such. 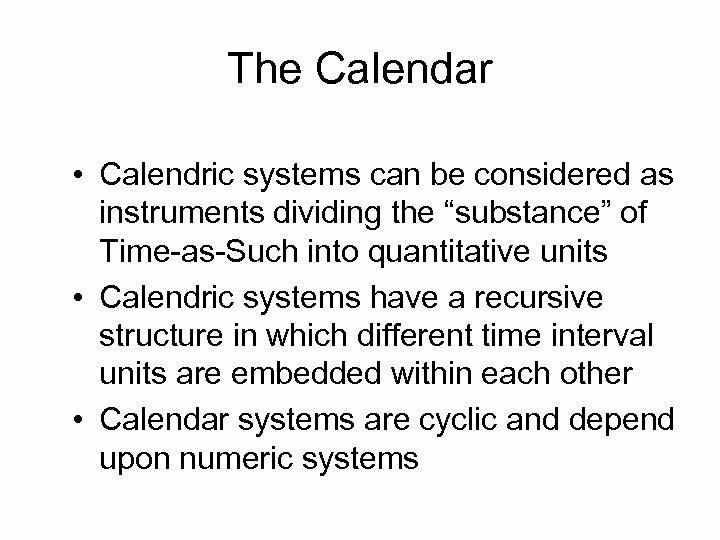 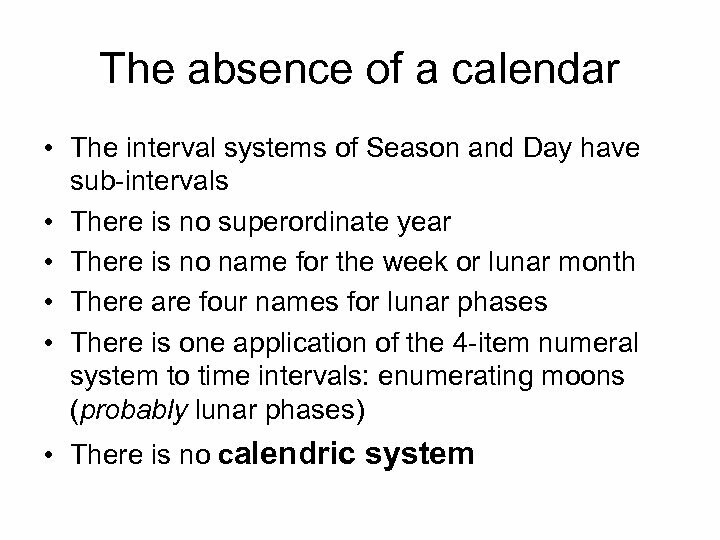 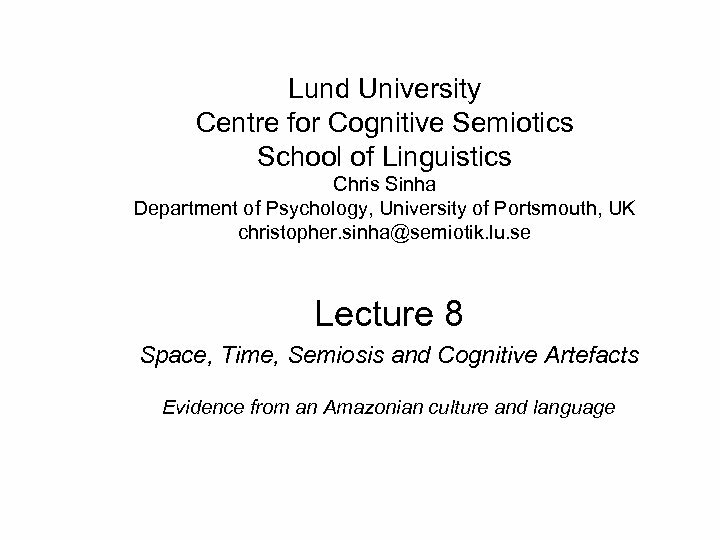 The conceptual transformation of time interval systems by numeric notations is in part accomplished by the invention and use of artefactual symbolic cognitive artefacts such as calendric systems.